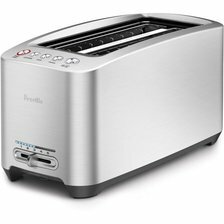 Pros The Breville toaster has wide slots and can accommodate any type of bread. It also has a lift and look feature so users can check doneness without interrupting the toasting cycle. it has five settings for browning, a bagel and a frozen setting. Cons Some users have reported the toaster's audible alerts and lights will start beeping and flashing independently, and that the appliance doesn't brown evenly. Summary This is an expensive toaster, and buyers may want to consider whether they want to spend so much on an appliance that does one job. Cons The sides get very warm, and some users have reported the toaster doesn't last. Other users say the appliance doesn't brown evenly, and also doesn't do well with items like English muffins. Summary For the price, it has a good many problems that have been reported, although the users who like the toaster really love it. 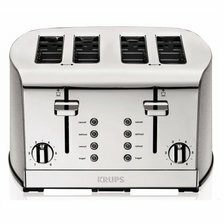 Pros The KRUPS KH734D Breakfast Set four-slice toaster is all metal and has settings for each side of the appliance. A lift up spring helps the user remove the toast easily. It has six browning settings, also settings for defrosting, bagels and reheating. Cons The exterior gets very hot. Denser breads, like bagels take significantly longer to toast. Some users have reported the units do not last very long. Summary This toaster does all the usual toaster jobs, but it is priced higher than the competition, and with the hot exterior, is probably not good for households with small children. 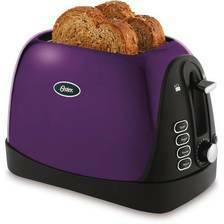 Pros The Oster Jelly Bean toaster has seven browning settings, as well as buttons for bagels and frozen items. It also has a keep warm setting. Wide slots accept thick bread or bagels. Cons Some users say the toaster burns bread unless kept on the lowest setting. The bagel setting toasts on both sides, which some users do not want. First time use may produce a chemical smell that does go away. Summary This toaster is reliable and durable, and affordable. It will toast bagels, although users will want to watch it to make sure they don't burn. 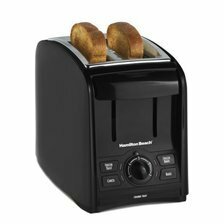 Pros The Hamilton Beach 2-Slice Cool Touch toaster has wide slots that will accommodate buns or bagels, five browning settings, and buttons for frozen bagels or frozen toast. Cons Doesn't push some toast high enough out of the slots, and some users say the cord is too short. 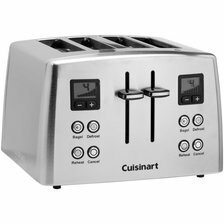 Summary For the price, a toaster that handles most bagel and bread toasting quickly and easily. It's a basic toaster, but does what it's designed to do.